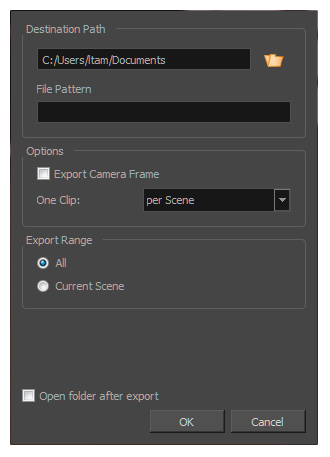 You can export your project's scenes, sequences or the entire project into animated Filmbox (.fbx) files. This can be useful if your project has 3D elements. The exported Filmbox (.fbx) file will contain all the 2D and 3D elements in your animatic as well as their animation. You can them import it in a third-party software and use it as a template to create the 3D animations for your production. All: Includes all the scenes in your project. Current Scene: Includes only the scene you selected when you opened this dialog box. Current Sequence: Includes only the scenes from the sequence you selected when you opened this dialog box. This option will only be visible if your project contains sequences.